A few months back I discovered that a couple of the websites I own were not working. After doing some troubleshooting, I contacted the web hosting service 000Webhost to see what the problem was. They said the sites were working fine on their end. I still could not access the sites from my computer, but oddly enough, I tested it out using my phone and was able to load the sites just fine. This meant it was something with the computer not being able to load the websites. Next I contacted my internet provider AT&T. After about 2 hours of customer support they said that the error was indeed on their end, but that they thought it was a problem with my modem. This is odd considering every other websites worked fine. They said someone would contact me about getting it fixed, but I never heard back from them. Just recently I tested the websites out from another computer several towns over and found the they would not load there either. This location also happened to be using AT&T for their internet. So after process of elimination it became clear that the issue was with AT&T blocking 000Webhosted sites. After doing some research I found that many other people are having the same issue of their 000Webhost sites not being accessible from AT&T connections. 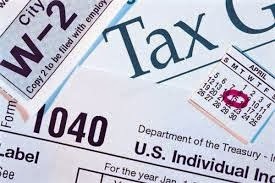 There are forum discussions about this topic both on the 000Webhost site as well as AT&T. Apparently there have been some abusive websites that were hosted on 000Webhost and because of this, AT&T decided to block a whole bunch of the 000webhost websites, even though it was just a small percentage of websites that were causing trouble. There does not seem to be much progress on this issue. 000Webhost is saying it is an AT&T problem. AT&T is saying that they have blocked it because of abuse and there does not seem to be any resolution happening any time soon. So what are we to do? Some recommend just moving the sites to another host, a paid host. What was good about 000Webhost is that it was free as long as you had your own domain name. I don't really want to move my sites and buy a hosting plan every year when there are free options out there. Is anyone else in this same situation? What is the best solution? For now I will be looking into other possible webhosts to move the sites to because as of now, they are not accessible because of the block from AT&T. Update 4-6-15 I finally decided to move the site I was hosting on 000Webhost over to Blogger and now it is working again. Of course it was a bit of a process and was kind of technical but I got it done. Also it involved remaking the site from scratch which was time consuming but at least now the website actually works. If you are in the same situation, I would recommend switching it to another hosting provider as well. Feel free to use the comments section below to discuss which pieces you have or which one's you need. Special thanks to the forum over at FatWallet.com for helping determine the rare game pieces. 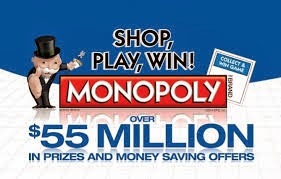 For odds chart and FAQ's about the Jewel Monopoly game, visit the official website here. Lately I have taken an interest in peanut butter alternatives, not because of any allergy or anything, but just to get some variety. Butters made from nuts and seeds are a healthy way to get proteins and fats in your diet. Recently I tried almond butter which was pretty good. It tasted just like ground up almonds. It also had more of a gritty texture compared to peanut butter. While I liked the almond butter, there was another butter I saw at the store which looked interesting and that was sesame seed butter. Sesame seed butter is also known as tahini and it is basically just ground up sesame seeds. The price was pretty good and the nutrition facts looked healthy so I decided to give it a try. The brand is Krinos and it comes in a 1 pound jar. The oil separates from the butter so it requires a lot of shaking before opening it. Compared to peanut butter, the sesame seed butter has more calories, more fat, and more protein for the same serving size. This is great if you are looking to get extra calories in your diet. It also has a little more fiber and less sugar. This product is 100% sesame seeds so nothing is added to enhance the flavor. Upon opening it I found the consistency to be very liquidy, in fact I didn't even use a knife to put it on bread, rather I just poured it out onto the bread. I tasted some with a knife. I found the taste to be somewhat bitter and sour. I would also describe it as a savory kind of taste. It is definitely different. Overall the taste was not that good, but still edible. It might be better if they added some flavor enhancements to it. Overall tahini sesame seed butter is a unique spread and a good alternative to peanut butter if you are looking to change things up a bit. The taste is not nearly as good as peanut butter but the nutrition is just as good if not better. It had been a while since I changed my smoke detector battery so I decided to change it. Before I took it off, I noticed it said to turn off the power supply before disconnecting. So I went to the circuit breaker box looking for the tab to turn off the power supply to the smoke detector. Unfortunately there were 24 switches and only 3 of them were labeled. It was at this point I figured I should probably take some time to figure out what all the switches actually do. This is not exactly an easy task. It takes time and a lot of organization. Start by making a list of all the electrical outlets and electrical appliances in the house. Try to be specific when it comes to the outlet locations. Usually most of the outlets in a room will be controlled by one switch but sometimes they are different. Once you have your list, start going through the switches one at a time. Turn off the first switch and go around to see what turned off. Once you find the room or location, test all the outlets in that area. You can use something like a night light or a cell phone charger to test if the outlets have power or not. Record the number switch next to everything that is controlled by that switch. Then proceed to follow the same test for each of the remaining switches. 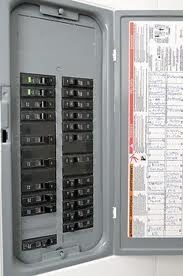 Once you are done, you should have a complete directory of all the circuit breaker switches and what they control. This is very important information to have handy in case you need to replace any electrical appliances or do any electrical work. It is best to know what all the switches do before you actually need to use them. You can write the functions on the label that is in the circuit breaker or do what I did and type up a new one that is clear and organized. Once it is typed and printed, cut it out and tape it inside the panel cover so you or anyone else who needs it will have the correct information for the circuits.